A new report on the activity of football agents has found that within Europe alone they make a combined income of around €400m a year (or £340m / $538.5m) at today’s exchange rates. The full 82-page report, compiled by the CIES Football Observatory in Switzerland – from a huge survey of agents and corroborated by official data from Fifa on international transfers – is available for free download at this link. Agents are on average aged 42. Only 3.4 per cent of them are female. Almost three quarters of agents hold a university degree. 71 per cent of them speak a foreign language at intermediary or above. Only 41 per cent of licensed agents carry out the job full-time. The majority operate in other business sectors – primarily law and finance. Only 42 per cent of the players represented by the respondents of the survey are senior professionals. This indicates that most of the agents are mainly active in the search for young talent, in the hope of making money in the future. While promising players can also take advantage of this situation, the pressure that intermediaries may exert on them is a controversial issue. The report also found that in November 2011, there were 6,082 licensed agents worldwide and 2,405 of them were domiciled within countries hosting the big five European leagues: England, Spain, Germany, Italy and France. Using the commissions data available in these five nations, it appears agents’ average earnings are upwards of €100,000 a year, although there will be massive variations. 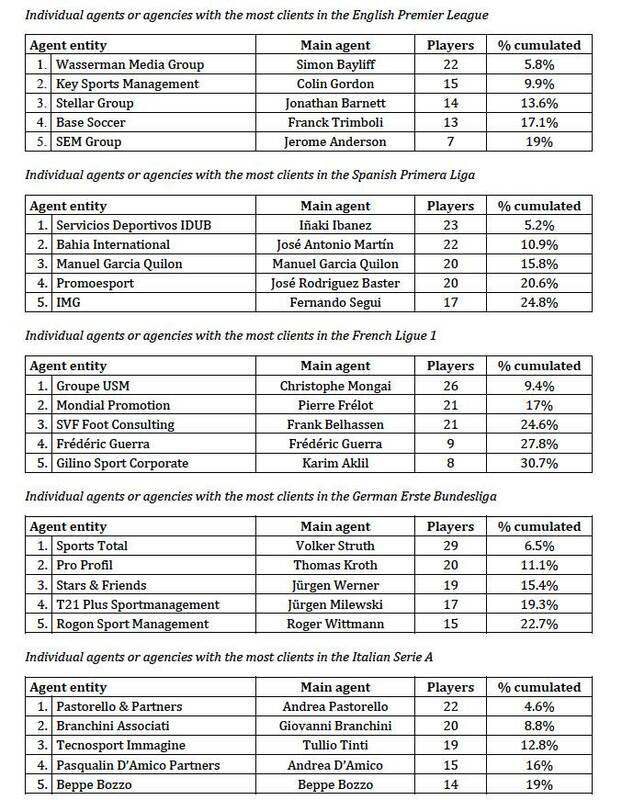 Half of all the players in the big five leagues are represented by a core group of 83 agents or agencies. The ‘biggest’ agents by most number of clients in the big five countries are in the table at the bottom of this piece.